How to export the voting results to Excel and what information you find in the spreadsheet. Mentimeter works seamlessly with Excel, letting you export the results from your presentation directly to a spreadsheet. You can also export the results as presentation screenshots. Once you have received votes on your presentation, you can export the results from your Dashboard. The first sheet lets you follow the individual voters, as they are assigned a number. You can see what they have answered on each question. 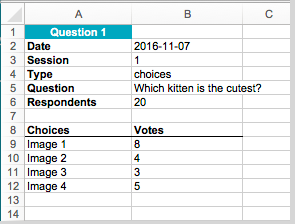 The second sheet presents the voting results per question. In this example, an Image Choice question, you can see how many votes the options have gotten. The third sheet shows the same information as the second one, but is different per voting session. Different voting sessions are started with the function Ask questions again that you access in the presentation view menu.